"People are really enjoying this program, and we have already been asked numerous times how it can continue after the research project ends. After taking a few lessons, people really understand that this is a social dance program, and they can really take it anywhere and dance with anyone who knows American style Ballroom/Latin dance. The seated men were skeptical at first, but now seem very excited that they are actually able to lead a standing woman. The power wheelchair users were skeptical too, but seem very happy to have found a fun activity that they can participate in. It has been truly fun for both seated and standing dancers. I hope to provide support, making this program more available to people in wheelchairs, perhaps by integrating wheelchair dancing into rehabilitation." "Before my first day with American DanceWheels, I was terrified. Growing up, I was a three-sport athlete who wouldn't get nervous, even for playoff and championship games. But dancing? Forget about it! However, my skepticism was brought to a screeching halt when I felt the atmosphere for the first time. All my worries and fears were checked at the door. I credit the kids for making me feel comfortable. They are so much fun and understand that we are volunteers and not experts. Their optimism is contagious. If I enter in a bad mood, I exit in a good mood. I genuinely believe American DanceWheels to be an environment that creates a symbiotic relationship between seated and standing partners. Standing participants may benefit through interaction, inspiration, friendship, exercise, and gainer a better understanding of a gifted, yet often overlooked population. Seated participants may benefit through interaction, expression, friendship, exercise, and acquiring a lasting knowledge of selected dance routines. 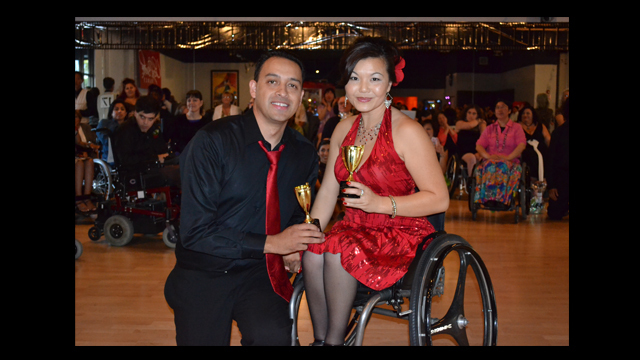 I am thankful from the bottom of my heart for the instructors and the kids at American DanceWheels. They have irrevocably changed my life and encouraged me to spread their inspirational message and positive outlook to anyone who is ready to make a difference in this world. Get involved!" "I'm reacquainted with my body beyond the denseness of paralysis. Emotional and physical feelings and sensations are presenting itself with vigor and fire. I am dancing again!" 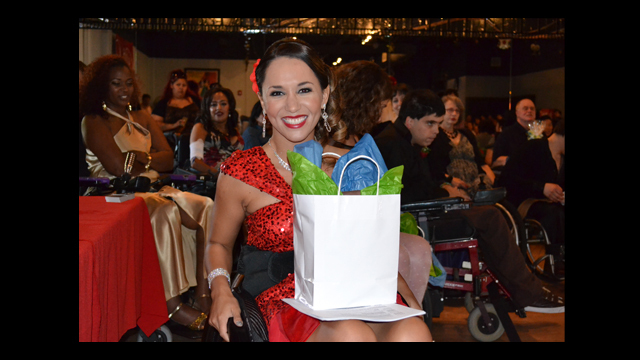 "The session held by American DanceWheels was a phenomenal experience that has further opened my eyes to the abilities and talent that we should cherish, respect, honor and celebrate! 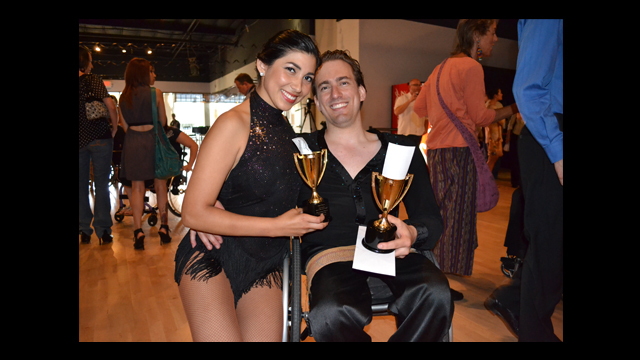 The instructors are fantastic ballroom dancers that raise awareness about nurturing the social opportunities for able-bodied and people who use wheelchairs. It gave me hope that if I should ever need a wheelchair, that I can still enjoy music, dancing, and a fun and active social-life. This session also provided me with the basic tools to inform and further interact with friends and family that use wheelchairs. ADF has so much passion for what they do, and it was a perfect way to end the conference." "I really enjoy the challenge of doing something that has only ever been offered to the able-bodied population. ADF has provided me with a way to experience real ballroom dancing. Now it's my turn to feel what it's like to float around the dance floor performing an elegant waltz, just like I used to watch my mother and brother do in our living room to "The Chipmunk Song." "I learned a lot about teamwork, built great friendships, and captured a better understanding about disabilities and adaptations. Your program will help me in my future career." "Thank you so much for dancing at the KenCrest 100th Anniversary Gala, which I think was the culmination of the event. As I watched you, I thought, 'This is what the best dance always is, the combination of talent, technique, heart, and spirit." "American DanceWheels beautifully exhibits with every performance the unlimited possibilities of dance expression and reaffirms that through imagination, creativity and a love for the art of dance, the human spirit can soar regardless of physical challenges." "Please accept my thanks for meeting with my students, and providing an inspirational demonstration and lecture about your experience in dance. As you know, I wanted my students to understand that people with disabilities can do beautiful things by any standard. Your performance demonstrated this possibility more elegantly than words can ever tell." "We got to talk to Ray quite a bit during the Colorado Star Ball weekend, and got to know him a little. Although I was impressed watching him dance with his partner, what really blew me away was when I saw him leading former rhythm champion, Diane Gingerich, who was there judging, in a social rumba. There was no question that he was really leading, that the patterns were complex, that he controlled the rhythms, and that he was dancing - and dancing well!" "After watching your performances over the last couple of years, my awareness of people using wheelchairs has changed. I was on vacation this past fall and asked a man in a wheelchair to dance at a club, which is something I never would have done before. This has resulted in a lasting friendship. Keep up the great work!"